Indian-American lawmakers on Wednesday criticised US President Donald Trump's maiden address to Congress, saying it lacked specificity and offered only unrealistic plans on issues like immigration and Obamacare. Claiming that Trump's "rhetoric did not match reality", Congresswoman Pramila Jayapal alleged that he uses "repeated falsehoods" about immigrants to justify the logic behind his "inhumane and barbaric" executive orders. "Tonight, the President's rhetoric did not match reality. 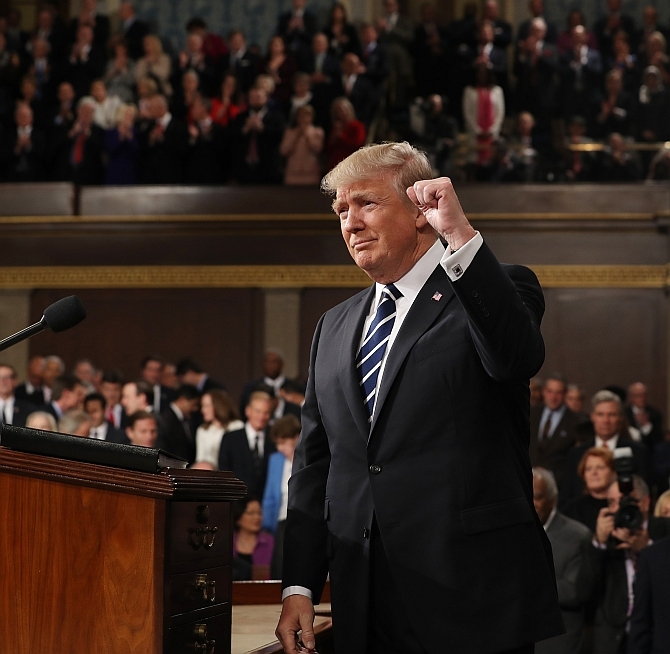 He said things that sounded good, but they were the opposite of his actions and rhetoric of the past," Jayapal said after Trump's address to Congress. Jayapal along with three other Indian-American lawmakers from the Democratic Party criticised Trump's address. "He repeated falsehoods about immigrants to justify the logic behind his inhumane and barbaric executive orders that have thrown our immigration system into complete and utter chaos. Instead of offering specifics and a plan to expand healthcare for all, President Trump, once again, called for the repeal of the Affordable Care Act leaving millions without health insurance," she said. Jayapal, the first Indian-American woman to be elected to the US House of Representatives, said that the President talked about tax relief for the middle class, but the Trump tax plan is nothing more than a big tax break for the rich. "He mentioned reducing poverty, but in fact his budget blueprint would decimate the very social safety net programmes that help people climb out of poverty," she said. It was surreal to listen to Trump talk about "draining the swamp" after he appointed billionaires, lobbyists and Washington-insiders to top posts in his cabinet, she said. Three-term Indian American Congressman Ami Bera said that national security is not a partisan issue. "Defeating ISIS and keeping communities safe is our priority on Foreign Affairs," he tweeted. Bera also spoke against Trump's move to build a wall along the Mexico border. Bera also said that Trump's proposal to repeal Obamacare without a replacement would kick 20 million people off their health insurance. California Senator Kamala Harris, the first Indian-American Senator, said in a tweet that, "To blame all Muslims for terrorists' actions and suggest we block immigrants based on religion is Islamophobia. Plain and simple". California, she said, has the largest number of immigrants, both documented and undocumented, in the US. "We will fight for them. We are stronger together," she tweeted. "We need pathways to citizenship, not un-American & unrealistic plans to break up families," Harris said. Congressman Ro Khanna said Trump once again "lacked specifics". The time for promises is over; action must be the agenda now, he asserted. "If Trump truly wants to support working families and energise the American economy, we need to empower ordinary Americans. The rules of the economy must be rewritten. Instead of giving tax breaks to the most wealthy and big corporations, we need to provide relief to middle-class families, small business owners, and students," Khanna said. Trump, he noted, spoke fondly of the innovations that America celebrated during its 1876 centennial. "If we really want to support that next (Alexander Graham) Bell, (Thomas) Edison, and (Eliphalet) Remington, we need to invest in apprenticeship programs and technical training programmes that will help people fill the tens of thousands of open positions in the tech industry across the country," he said. When they came for the Muslims, where were you?